See what's on draft. The beer selection changes frequently so you're bound to find something new and great if you visit weekly. There's also a more consistent bottle menu available. Grilled cheese! Here the classic Egg and Cheese gets a substantial upgrade. Egg and cheese is filled with a lush dollop of creamy ricotta, and sandwiched between thick slices of cheese-crusted Balthazar brioche. 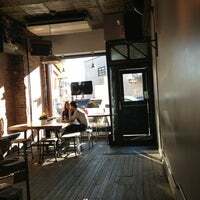 The Queens Kickshaw is a quaint venue with great salads and grilled cheese for those lunch hours when you want something good to eat. It is perfectly located in walking distance from our office. You cannot go wrong here. All the food is great, and it's the best iced coffee I've ever had! Oh, and the chocolate pudding is amazing if you're in a sweet mood! The selection of beer is on point. Definitely get the Gouda grilled cheese. Salty, spicy, and deliciously crunchy. 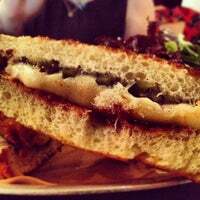 Definitely in my top two of best grilled cheeses in NYC. I am absolutely in LOVE. They played only songs I adore since the moment I walked in. Kale salad is on point. Ambience is damn sweet. So happy I live right around the corner! Will come, infinitely. 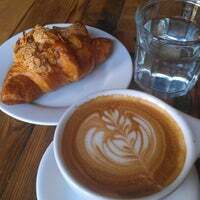 Excellent neighborhood cafe, bar, and sandwich spot. Some of the best coffee and grilled cheese in Queens, with an esoteric beer, wine, and cider list. the potato layer cake is tremendous, and available for weekday brunch. my favorite daytime place in all of new york to work + listen to nina simone, also happens to be three blocks from my apt. 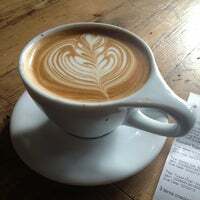 Try one of the V60 Pour-overs here; it's a must! I just tried the sunny side eggs and potato cakes. They're perfectly seasoned. Love this place. Every single thing is good here. No exaggeration. The curried pumpkin seeds & popcorn snacks are delicious and totally worth it! 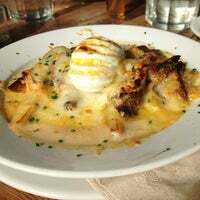 The bread pudding is also awesome! Great service and super cute place! Really enjoyed this place! 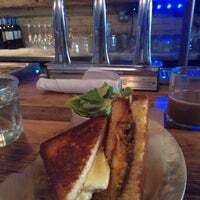 Amazing grilled cheeses, with a gluten free bread option, thank you 👍. Iced coffee is great too! Has a chill atmosphere and good vibes. I will be coming back! 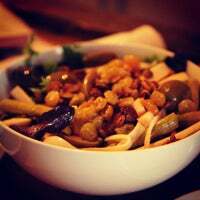 A great and reliable go-to (secretly vegetarian) restaurant in Astoria. Great for a full meal, quick snack, or just a drink of obscure craft beer and even more obscure ciders. 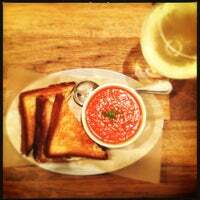 I always say ill try something new and then always order my favorite: The Cheddar-Mozzarella with tomato soup, a Golden Monkey tea and a side of Miso Mustard pickles. Nothing better on a cold day. Cozy space with delicious grilled cheeses (recommend both the Gouda and the Brie!). Rich and unique flavors. Chill vibe and decor, too. 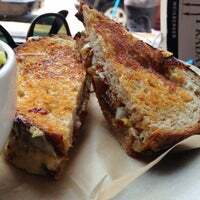 The gouda grilled cheese is delicious - perfect blend of sweet + savory...and the jalapeño peppers give it a nice little kick - it's a must-try!!!! The Gouda Grilled Cheese is so delicious with a spicy kick to it! Will definitely be back for more. The shepards pie is awesome too! The food was excellent. I enjoyed drinking the most. The Mac and cheese was well advertised and worth the visit. Atosphere was kind of gothic but the food saved the night. Great coffee and grilled cheese. 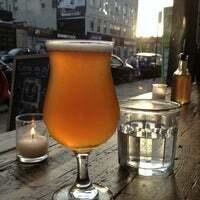 But more importantly, this place always feels like a bit of Austin in NY... A cool, comfortable vibe where the hustle and bustle is a little less felt. If given the chance to visit, you'd be mistaken if you pass this up. Not only is service friendly, the food is expertly choosen and perfectly prepared. The roasted ravioli was incredible. 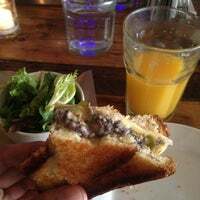 Loved the Gruyere grilled cheese with a salad that comes on the side. Trendy, quiet spot that's perfect for meeting a friend for lunch. They also serve alcohol. Don't miss out on the homemade hot sauce! It isn't too hot, and it has huge flavor. Perfect with the grilled cheese. Also, this place is completely vegetarian! incredible neighborhood spot. 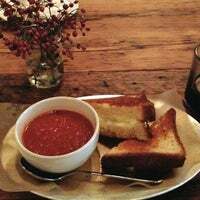 the brioche grilled cheese with tomato soup is the business, with an iced coffee or pint of constantly rotating local beer. wi-fi, great space, friendly staff. perfect. For those vegans/lactose intolerants out there, they have soy milk and a roasted veggie side that's yummy. They also have a few creative salads you can get sans cheese. Please get their Banana Bread pudding omg it's amazing!! A reason why I would come back to this laid back atmosphere. A (awesome) very carefully selected menu of ciders and draught beers, and the owners are often there should you care to have a detailed cider chat! 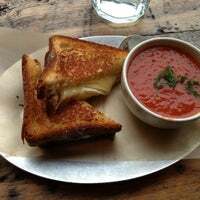 Highly recommend the Gouda grilled cheese sandwich, and the tomato soup both taste great. Coffee I tried the iced Guatemala with milk, tasty. Only bad thing was the service. Waitress was rude. Get the Gouda Grilled Cheese! You get sweet and spicy in this yummy dish. You won't regret it! Great food, great drinks (the coffee & beer especially), great staff, great patrons, great music. An absolute must if you ever find yourself in the area! The potato layer cake with sunny eggs is amazing. As is the Michelada. Great brunch stop before visiting the museum of the moving image. 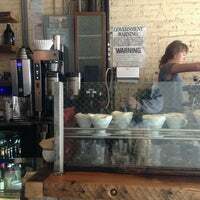 Specialty coffee, scratch cooking, fancy grilled cheese, craft ales, cider, and wine in Astoria, Queens NY. 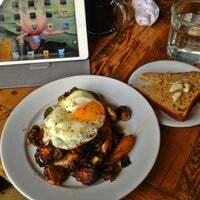 "Phenomenal home fries, bacon is even better. Nice spot to eat outside"
"Wow, great lunch with stuffed zucchini. Great red velvet cupcakes, flavorful and not overly sweet." "Great place to hang. Cool music, fun staff. 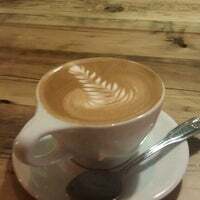 Great coffe, chai tea - the hot chocolate is way too sweet!!!" "Has so many cool pieces from all the classic movies! My favorite part was definitely the portrait gallery"
"Great movie theatre especially for date night as there's a lot of cool restaurants and bar surrounding the area. Great screens!" "Great beer selection, excellent selection of meats and cheeses, super nice staff and a decent patio."